After years of research to find the breed of dog that would fit the bill for us we settled on the Black Russian Terrier. And so we then set out to find the perfect Black Russian Terrier puppy! We were lucky in December of 2004 to be able to bring Tasha home. Imported all the way from from Vladivostok, Siberia Tasha instantly stole our hearts. Although a beautiful representative of the breed, Tasha was diagnosed with mild hip dysplasia when we screened her at age two. Therefore, she is spayed. However, this bold, courageous, intelligent girl still has a rich career as a therapy dog ahead of her. Tasha proved she is a true working dog by passing her Canine Good Citizen Test at six months of age and her Therapy Dog International test at the minimum age allowed - one year. She has also passed the American Temperament Test Society’s temperament test and thus has the TT title. Now retired, she was a regular and welcome visitor at several area nursing homes. She still enjoys training and pleasing people. To view many more photos of Tasha please visit her photo album. 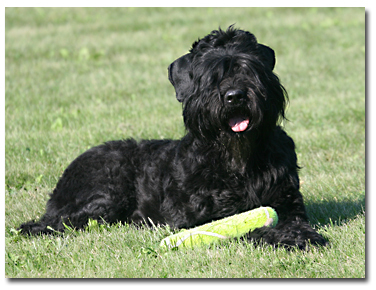 The Black Russian Terrier - the “Black Pearl” - is a relatively young breed only first developed in the 1950’s. After World War II there was a great need for working dogs in the Soviet Union. The Soviet’s needed a strong, courageous, loyal, and trainable dog, stable and reliable in temperament that could withstand the extreme climatic differences within the country. Thus, the state’s Red Star Kennel started in earnest to breed such a dog. Over one hundred dogs of at least seventeen breeds were used in the creation of the Black Russian Terrier. 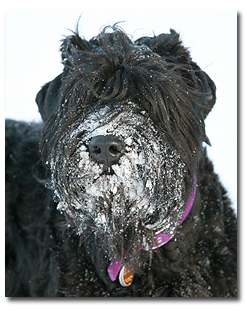 Of primarily influence were the Giant Schnauzer, Airedale Terrier, Newfoundland, and Rottweiler. After several generations the Soviet’s had a dog that was breeding true to what they wanted. Working ability was the highest priority, with appearance relatively unimportant. By 1957 hobby breeders in the Soviet Union had gotten second and third generation Black Russian Terrier puppies from the Red Star Kennels. From those puppies and other out-crossings, then they worked on improving the breed’s appearance, while preserving the breed’s strong working ability. In 1968 the FCI approved the first description of this young breed, and in 1981 breed status was official recognized. 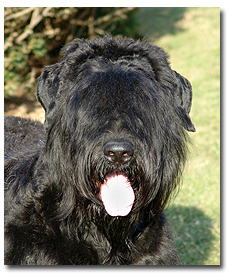 The Black Russian Terrier was welcomed into the AKC in 2004. 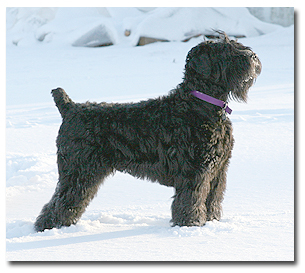 Today’s Black Russian Terrier is a very large strong dog with heavy bone and ample muscle. Their jet black coats are easily adaptable to many climates and with regular grooming they do not shed. They are true working dogs - stable in temperament, confident, trainable, and adaptable. They are natural protectors that are loyal to their families. It is all these qualities that are making this young breed’s popularly quickly grow by leaps and bounds all over the world. Like most large breeds, hip dysplasia can be an issue. Sound breeders make sure their dogs are screened for many genetic health problem areas such as eyes, hips, elbows, thyroid, and cardiac. They know health is just as important as proper breed type. For more information about the breed, including the AKC breed standard, please see the links page. Copyright 2002-2018 Sand Meadow Farm LLC - No part of this site may be reproduced.